I remember my childhood in several contrasting episodes. The more beautiful parts, I guess, were spent in my grandparents’ household where photography, music and religion were a way of life. In the darkroom that my grandfather built, a crucifix hung on the wall, together with unframed photographs and an overused apron stained with Kodak chemicals. The handcrafted wooden xylophone and bajo de arco (double bass) stood out majestically across the equally large photo enlarger and some developing trays. Siesta times would be spent listening to my grandfather playing music. Wednesday nights would be spent praying the novena and reciting the litanies. There were many days when I saw my grandfather watch my uncle process rolls of films. After retiring from Kodak Philippines where he was darkroom supervisor for many years, my grandfather continued to print in the house, bringing home his love for the medium and unconsciously passing on the skills to his grandchildren. I had easy access to his camera, the enlarger, photo paper and the chemicals. My grandfather did not have any prohibitions. I don’t remember being told not to touch anything belonging to my grandfather. As his grandchildren, we made photograms from boxes of expired photo paper, exposing them to the sunlight while creating imprints with our hands, before the images disappeared with further exposure as the paper turned black. At age 9, I received my first box camera and at 10, my first rangefinder. When my grandfather passed away when I was a teenager, I inherited his Argus Argoflex twin lens camera, which I later used for personal projects. Whenever I am asked when my interest in photography started, my mind will instantly fly back to the darkroom where I watched my grandfather print large photographs of places and faces of common people. Patiently and with careful precision, he would expose the paper to the light of the enlarger before immersing it into the developer. I watched in fascination and wonderment. Slowly, a vague and faint image would emerge on the paper and I would squint my eyes to see it under the infrared light. A few seconds later, this image would become clearer and more magical to a six-year-old, as the image of a face, for instance, “came out”, the eyes alive and vivid as in real life. Then, grandpa would dip the paper into the stop bath before desensitizing it in the fixer to form a permanent image. Despite this early exposure, I did not wish to become a photographer. It did not occur to me then that it was something one had to study formally. To me, photography was just there, a part of my grandfather’s life. It was as available as the piano and as omnipresent as God was to him, a devout Catholic. In my family, the women who came before me did not have the chance to extend their horizons beyond the confines of the home and did not have much of a “world view” to encourage us, the younger generation of women, to indulge in art or in social sciences like anthropology. Instead, the women in my family encouraged us to become nurses, midwives, teachers or secretaries, with the constant, subtle reminder that any of these careers should eventually lead to motherhood. I never wanted to pursue any of these prescribed careers. Instead, my mind wondered about places and people. Once in grade school, I read about a group of people who lived in a place in northern Philippines called Bacun and they were called the Kankanaey. I remember the soft, washed out image on the page of the textbook—a group of half naked men, women and children with shabby hair, sitting awkwardly on top of a rock. They were facing the camera, their faces blank and almost forlorn. Not much was said of them, except what they were called and where they lived. I wondered what they had to say for themselves. Why were they staring blankly at the camera? My first interaction with indigenous people happened in the 90s. I was then working as a researcher in the university. Although we were doing feminist research and I was doing part time photography work, I was not required to do much fieldwork. I felt creatively underwhelmed. I wanted to immerse myself in community work where I could talk face-to-face with people and learn about their culture, their everyday life and experiences. In 1999, as a novice photographer, I embarked on a personal project. With little resources and fueled only by inspiration from the works of admired photographers, I packed my bags and took a 16-hour boat ride to Palawan. That first trip took me to places in Puerto Princesa—some of which were already discovered and frequented by tourists, while others were yet to be explored. One of these unexplored areas was the Batak indigenous community at Sitio Kalaquansan, one of the eight Batak settlements found in the north-central and central-eastern parts of Puerto Princesa. This place, together with the Babuyan and Langogan settlements, constitute the largest Batak communities at Puerto Princesa. In 1999, this particular settlement was a four-hour drive from the city. One had to travel rough, dusty roads to San Rafael, from where, after a further nine to ten-kilometer trek, the trail to the Batak settlement would begin. Visiting travelers rode on old minibuses and jeepneys filled mostly with peasants travelling for trade. More often than not, these traders also transported domestic animals, usually piglets, goats and native chickens, to the northern towns of Puerto Princesa. Despite the inconvenience, I consider myself fortunate to have travelled there, experiencing the beauty of the rainforest before the trees were cut down and the river destroyed (due to the massive quarrying for the construction of a nearby road). My first visit to the Batak community, though brief, provided me with a glimpse of their daily grind. I was grateful for the many conversations I had with the Batak women—the wives and mothers who shared stories about family life, relationships with husbands, joys and difficulties of motherhood, and the struggles for survival. All these narratives informed the research and photographic work that I would conduct on the Batak in the years that followed. In 1998, I held a solo exhibit at the UP Vargas Museum in Manila showing photographs which were more focused on form rather than on the lives of people. I felt it wasn’t what I wanted to do. For me, it was more an exercise in visual calisthenics than being connected with my creative vision. A close friend believed that this exhibition was an unconscious attempt to free myself from memories of a turbulent childhood. It was an escape taking the form of beautiful landscape. Childhood was represented in photographs of dark corners, and silhouette images of doors after doors, windows after windows. The plan to pursue the Batak project came to a halt. I entered a new phase in my life, got married to another artist and became pregnant with my child. At that time, I received another invitation to hold another solo exhibition. The photographs I presented, although different, were again basically about forms and shapes—a repetition of the first show. It was not because I had not taken any photographs of people since the first solo, but because I felt that I did not have the chance to know the people in my photographs well enough, either through research or interviews. When I gave birth to my son the following year, the dream of doing some serious photographic work took a backseat. Marriage was a lonely journey and motherhood was about sacrificing some dreams and aspirations. Motherhood consumed me, leaving me very little time to do photo assignments. Sadly, this hiatus became an extended one. In 2001, my parents passed away one after the other. I remember the day my father woke up from coma and I had to break the news of my mother’s passing to him. It was unbearable. I was completely unprepared for their deaths and for the life of being a single parent after my marriage ended. The next four years were years of paralysis. I was in limbo. Those were years of helplessness, of in-between-jobs, of being alone, of accepting photographic work that did not interest me. With two deaths and a failed relationship, my son was the only reason for me to stay alive. I struggled to do something creative. I knocked on doors, seeking funding for documentary photography work. As doors closed one after the other, I became more desolate and dysfunctional. I had lost my enthusiasm and thought of giving up photography. I felt that I could not recover from extreme loneliness and from my intense disbelief in the God of my childhood. 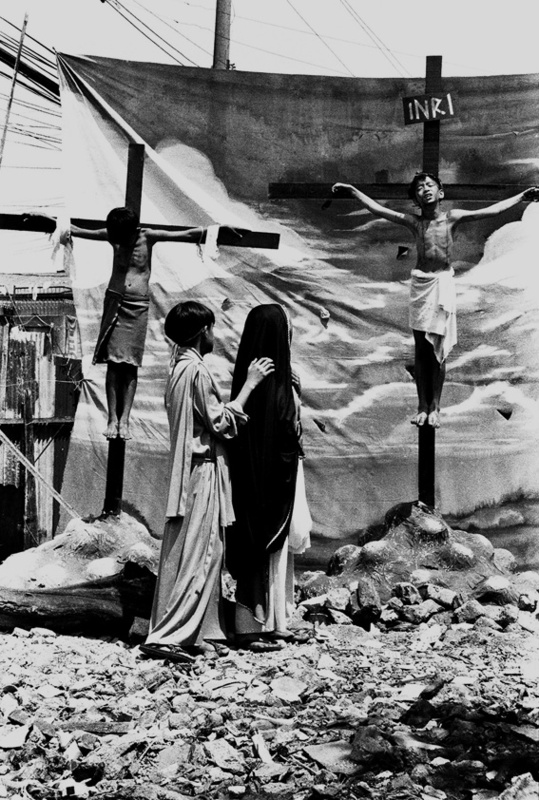 During one Lent season, I experienced a moment of epiphany when I saw, in the distance from my house, a group of youngsters performing the Cenaculo (a play depicting the life, sufferings and death of Christ). It amazed me. I had not seen youngsters perform the Cenaculo before. The dramatization looked real and photographic from where I was. I rushed to grab an old manual camera loaded with TRI-X film and a fixed lens. I took a few shots. While seeing the youngsters through my viewfinder, I wondered what adult atrocities and life challenges would compromise their pure and innocent faith in future. When I finally made the contact print, I was struck by the image of the young Christ: his head looking up, his arms outstretched on the cross, depicting total surrender. I immediately recalled what John Berger wrote in that “the visual is astonishing and why memory, based upon the visual, is freer than reason”. Suddenly, my photos were making some of my life’s realizations obvious to me. Holding the camera again, taking that shot and printing it in the darkroom—the whole chain of events felt absolutely right. I never felt good for a long time. A month later, I made a conscious decision to photograph again. I went back to Palawan to do serious research and photographic work on the Batak for my graduate thesis at the University of the Philippines. I received a modest grant from the Philippine Social Science Council, Air Philippines, YKL Color and administrative/fieldwork support from Haribon (an NGO focusing on environmental issues). The subsequent trip received another grant from BPI Foundation, allowing me to visit the rest of the Batak communities across Puerto Princesa. Though a nomadic group, the Batak have permanent settlements where they stay whenever they are not gathering food or farming in the mountains. We spent most of our time at these settlements, building rapport with the groups. We immersed ourselves in the communities and conducted interviews. Since 1999, I have collected materials in the form of oral narratives and photographs on many aspects of their everyday life. I have also documented the Tagbanua, another indigenous people that live alongside the Batak. Over the years, I have witnessed the children growing up, men and women ageing, and elders succumbing to illnesses. They struggled with hunger, malnutrition and epidemics while trying to maintain their traditional life, resisting total assimilation to modernity. It was not always a bliss to visit the Batak. Fieldwork was challenging because of issues like the shortage of food and drinking water, the threat of malaria (which affected my research team during the fourth fieldtrip) and the difficulty of transporting photographic equipment, especially when we followed the Batak as they roamed the forest. If left alone, the life of the Batak would be simple. However, due to external factors like the destruction of their primeval forests, their fight for survival has become more complex. I still dream of continuing my work on the Batak, capturing their rituals in moving visuals, establishing a school of living traditions run by the elders, and helping them market their crafts. In 2005, I spent a fruitful year in Thailand when I was granted an Asian Scholarship Foundation fellowship to conduct research and pursue documentary work on a small group of people living in the mountains along the Thai-Laotian border. 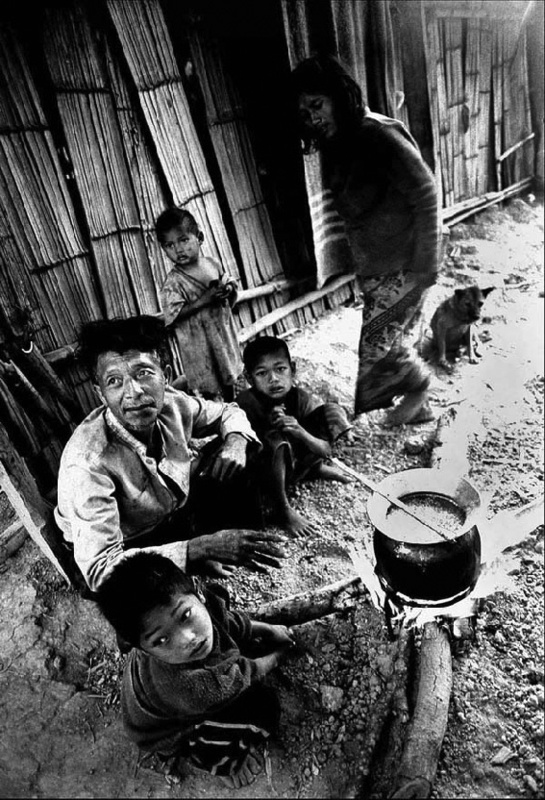 Known as the Mlabri, they were resettled permanently in villages across two northern provinces of Thailand, namely Nan and Phrae, due to the communist insurgency and the massive destruction of forests. The Thailand fellowship was a great opportunity to extend my work beyond my own country. The preparation, however, was not simple. I had to take into consideration the needs and safety of my four-year-old son who was travelling with me to Nan and to the mountains where the Mlabri people lived—often alongside the Hmong or the Meo (minority groups in the uplands of Thailand). Prior to the move, I made two trips to Thailand to visit the Hilltribe Development Office and my host, the Social Science Institute at Chiang Mai University (CMU). I also had to secure research permits from the National Research Council of Thailand and the governor of Nan province. I used the second trip to find a house in the city and one in the mountains. The job of a documentary photographer/researcher is not without romance. However, while every adventure brings me to new highs, it can also be at times frightening. In Thailand, I had the additional burden of protecting my child in an unfamiliar environment. The hut that was assigned to us by the Hilltribe Development Office was a very basic one. It was located in the heart of a Hmong village. No amenities were provided, not even a pile of firewood for the small cooking stove. We had nothing but four walls and a roof above our heads. In the kitchen, there was an opening covered by chicken wire, so that smoke from the stove would not be trapped inside the hut. The opening proved to be problematic during winter when the temperature would sometimes drop to five degrees. At times, my mind would be filled with anxiety, especially during festivities when the men in the village would get drunk, perhaps also high on opium, and would pound loudly at my door. Luckily, nothing untoward happened during our stay. Instead, I got to know the Hmong very well. I had never seen such an industrious group of people, hardworking and committed to their families. The Mlabri are equally hardworking. However, due to their dwindling population and the scarcity of farming land, they depend on the Hmong for their economic needs. They have been working as farm laborers for the Hmong when the latter expanded their homesteads and shifted from cultivating opium to food crops. The Hmong way of life has greatly influenced that of the Mlabri people. From being hunter-gatherers, the Mlabri have become seasonal farmers. One of my most memorable shoots was during the harvest time. I traveled with the Mlabri on a truck, together with my son and camera bag. The truck took us to a higher mountain, where they would harvest rice. During the shoot, I had to tie my son around my waist to keep him from falling off the cliff. It was a hot and humid day but we both endured the shoot, and the photos turned out to be very interesting. Since I could not speak or understand the Hmong or the Mlabri languages, I had to work by intuition. Later, my son would learn their languages and serve as my translator. Whenever we were in our rented house at Nan city, I had to follow a regimental schedule that allowed me to accomplish my work while performing my duties as a mother. I must have loved my work so much. Or else, I doubt I would be able to get through the exhaustion and the emotional ride. My enlarger and my photographic tanks were placed in the laundry area, so that I could process film and print while doing the laundry. I cooked while reading to my son. My roles as a researcher, writer, photographer and mother have always overlapped. Being away for one full year from people I knew, while isolating initially, proved to be very rewarding. Being in a country where nobody knew me and the kind of work I did was definitely liberating. I liked the anonymity. Before that, the opinions of fellow photographers really mattered to me. I always needed affirmation about my work. At Nan, I did not need it. While I loved collaborative work, I was surprised to realize that I enjoyed working alone even more. I came face to face with my creative self and my own ability to make things work without assistance from anyone. For the first time in years, I was confronted by myself and felt extremely happy with the confrontation. In Nan, I was just an artist. I did not make pictures in order to compete or make myself known. Everything was pure and simple. I woke up every morning to conduct interviews and take photographs. At the end of the day, I would write and do my darkroom printing while my son was fast asleep. The findings of this fieldwork were presented at CMU. It was followed by a solo exhibition of more than 40 black-and-white photographs at the CMU Art Center. Looking back, I have always been fascinated by the everyday routine of people. I still find myself staring at people in their most unguarded moments, when they go about their daily routine in trains, in shops, in market places. In Thailand, I was able to take photographs of almost everything I saw—however mundane they might be. This habit of taking photographs of everyday affairs brings forth certain subtleties in human experiences that are often taken for granted. Immersing myself in photography has given me an understanding of how to represent people closest to the ways they wish to be seen and understood. I enjoy participating in their lives. It gives me a strong sense of human connection. The images I love best are those of people in their most generic and unguarded moments. I always strive for absolute honesty in my work. I don’t wish to embellish my photographs or to exaggerate reality through juxtapositions or complex compositions. I prefer to shoot with my favorite 24mm and 90mm fixed lenses. I want to depict reality with my lines as straight as possible. I want my photographs to be honest, straight and simple. Recently, I had to look at all my photographs in preparation for another exhibition. Looking at each photograph reminds me of every experience in my life. I think of home and being away from home. I remember the times when I had nothing but found something to pull me through. I look at my photographs of the poor and the marginalized, and see how their lives parallel my journey: how they grapple with poverty and exclusion, yet manage to find something to bring them to higher ground. How do you capture these ideas in photographs? There is no easy solution. Teena Saulo is a photographer from the Philippines. This is a reflective piece concerning her documenting practice, written in 2008. Saulo is now a PhD student (Anthropology) at the Australian National University. Previous PostBest Indonesian Photobooks of 2014Next PostIs Photography Dying?